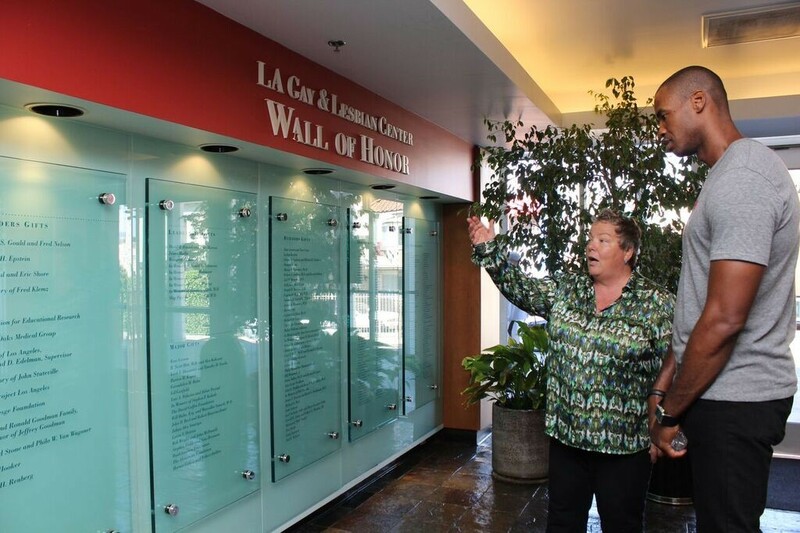 Lorri L. Jean giving a tour to retired (and openly gay) NBA player Jason Collins. TO SAY THAT LORRI L. JEAN supports LGBT rights would be a massive understatement. Her journey began in 1979 when, as a student at Georgetown University, she sued the university to prohibit discrimination based on sexual orientation — and succeeded despite staggering opposition. Jean’s path then led her to the CIA — naturally — where she was the first openly gay or lesbian person to receive top-secret security clearance. She’s been an attorney for FEMA, executive director for the National Gay and Lesbian Task Force, and has worked with the Los Angeles LGBT center on and off since 1993. Jean is now CEO of the LA LGBT Center, and her passion for helping other members of her community has never been more of a driving force in the organization’s mission. She spoke with Lady Clever about the hurdles she overcame as a pioneer for equal rights, why she’s never backed down from standing up for the LGBT community, why marriage equality doesn’t necessarily amount to equal rights, and the opposition the LGBT community is still facing. Your resume is impressive — almost intimidating! Is there a particular accomplishment or honor you’ve received that stands out for you or that you’re particularly proud of? In terms of honors, in September of 2014, Los Angeles Magazine named me one of the 10 most inspiring women in Los Angeles. What I liked best about their recognition was that they were expressly acknowledging transformative agents of change. I loved that. In terms of accomplishments, I think I’m most proud of my role in helping to build the Los Angeles LGBT Center into the world’s largest LGBT organization of any kind. We are ten times the size of the next largest LGBT Center and twice the size of the next largest LGBT organization. No one does more for LGBT people than our Center! There are many people who experience inequality and injustice, but might be too scared to take action. You’re a pioneer in the LGBT community for taking action. Where do you think that inner strength and bravery comes from? Honestly, I have to give the credit to my parents. They always believed in me. And they raised me to believe in myself, and with a key value of trying to do the right thing even if others weren’t. Of course, they didn’t realize that I would grow up to be a lesbian and how particularly important those qualities would be to me. Helping me to grow up with a strong self-concept has been invaluable to me in every way, but especially in coming out and standing up for my community and myself. For example, as I was coming out, it didn’t take me long (a few weeks) to reach the conclusion that there was nothing wrong with me for being homosexual. Instead, I concluded that there was something wrong with society’s attitudes about homosexuals. That’s a strong personal foundation on which to build. At the beginning of your work in activism, did you ever feel fear or worry acting as a mouthpiece for your community, during a time when there were tremendous amounts of opposition? How did you maintain your courage and persistence? Absolutely. But I never let my fears or worries become dominant. And, the one time I was actually threatened by someone in power — President of Georgetown University at the time, Father Timothy Healy, said he would ensure that I never practiced law in D.C. if I didn’t stop fighting for equal recognition for LGBT student groups — it did scare me, but it mostly made me mad. So, I fought harder. It helps that, like my parents, I’m also an eternal optimist. I knew there were serious risks, but I optimistically believed that I’d be OK. I also tried to be very strategic about how I conducted myself in professional environments before I became a “professional homosexual.” I worked very hard and did a good job and was friendly to everyone and was well-liked. When I ended up coming out during a time when people in positions like mine lost their jobs for being gay, my previous behaviors stood me in very good stead. You are the first gay or lesbian person to have received top secret security clearance from the CIA — were your government colleagues accepting of you? Did you encounter people who openly voiced opposition to a gay or lesbian person being in your position? This is where being respected by the leadership of my federal agency — because of how I had done my job before I came out — made a huge difference. There definitely were people who, once they realized I was a lesbian, felt I should not be in my position. And, they probably would have worked to get rid of me had it not been for the support I had from the organization’s top brass, especially the Reagan-appointed Director, Gen. Julius Becton, who was a 3-star general in the Army. He made it clear that I had his support. That quelled opposition within my agency. And, when the CIA wanted to deny me the special access clearances (above the top-secret level) that I needed for my job, General Becton fought for me, all while urging me to remain patient. Ultimately, we prevailed. 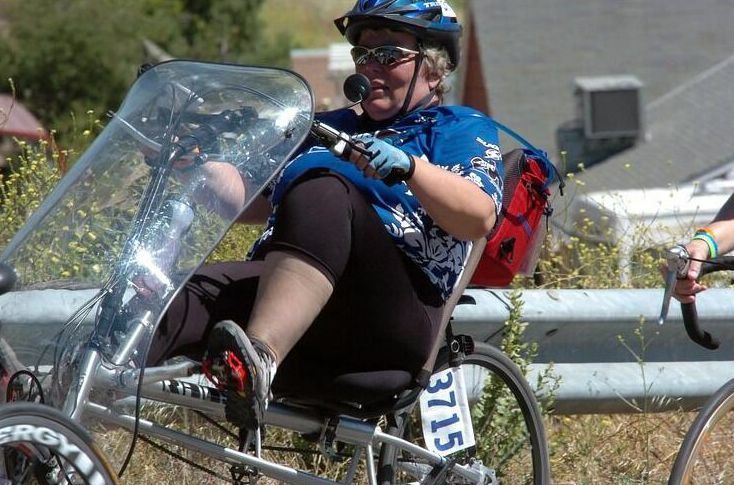 Lorri L. Jean participating in the Aids/LifeCycle, a 7-day bike ride to raise money and awareness in the fight against HIV/AIDS. Now that marriage equality has been extended to the LGBT community, what is the next step on the road to equal rights? I feel that it’s important to have both offensive and defensive strategies. Offensively, we should be working to secure better laws at the state and local level, and to gain more support for the Equality Act that has been introduced in the United States Congress (to replace the fatally-flawed Employment Non-Discrimination Act). We don’t have a chance of passing it with the current House of Representatives, but we need to keep building support so that when the balance changes, we’re ready. Defensively, we have to guard against the backlash from the religious extremists who are driving the anti-LGBT movement. They get smarter all the time, and their current focus is “religious exemptions” to nondiscrimination laws. Such exemptions could gut all of the progress we’ve made. What issues have you seen change most when it comes to acceptance and equality for the LGBT community? What issues do you think still face a long road and fight ahead? I think we’ve seen the most change in terms of the numbers of people coming out so that, these days, almost everyone straight knows someone who is LGBT. This has played a major role in the nearly wholesale change of the population’s attitude about LGBT people. Yet, we still have a long road to go when it comes to people’s fears for their children. The single most potent message in anti-LGBT ballot measures has been scaring parents about what we might do to their children. We have to find a way to combat this. What are a few of the programs at the LA LGBT Center that you’re particularly proud of? There are too many to choose only a few. However, a recent example is: given some of the stigmatization that has occurred around Pre-Exposure Prophylaxis (PrEP), I’m very proud of the role the Center has played in making PrEP available and in trying to combat the stigma sometimes associated with it. How can friends and family members get involved, either politically or socially, to help out the LGBT community? The two most powerful ways for allies to get involved are: (1) talking about and advocating for LGBT people and our rights in their social and professional circles; and (2) financially supporting LGBT organizations in their towns — these are the organizations that are really making an on-the-ground difference and we need financial support from outside of our community to continue to succeed. Almost everyone lives within driving distance of an LGBT community center. To find a center that is closest to you, check out the CenterLink directory. They will know about all available resources in your area. To learn more about their programs or donate to the LA LGBT Center, visit their website and keep up with their amazing work on Facebook and Twitter.